Drew Gordon’s loss is Reeves Nelson’s gain. With the former Starting Center long gone, Freshman Nelson has been getting his chance, and on Sunday afternoon he really made the most of it. 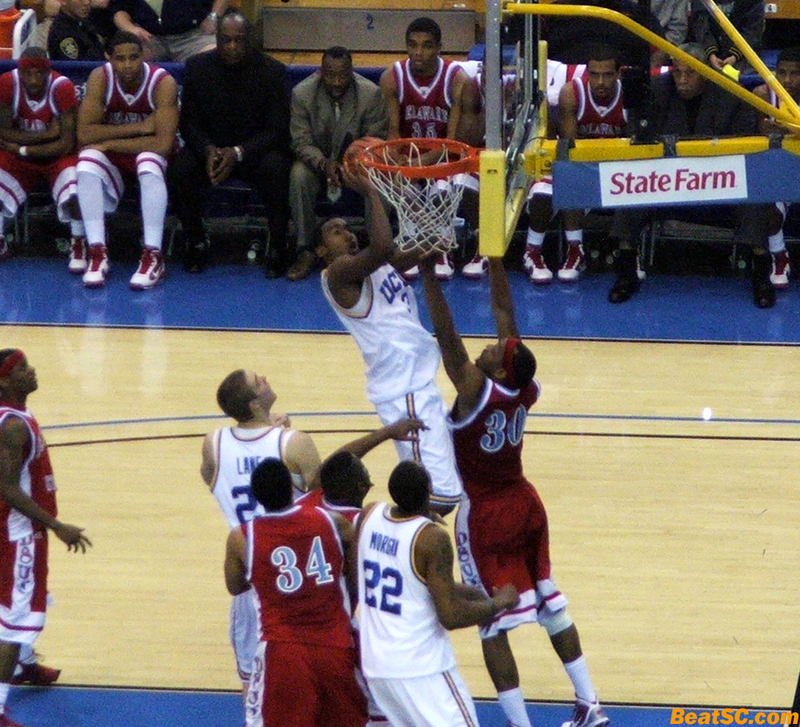 Against a vertically-challenged Hornets team, Nelson was able to assert himself inside, and basically take over the game. Behind Nelson, the Bruins went on a spree in the first half, doubling up on DSU 38-19 at the break. It was a good thing that Nelson brought his Offensive game, because the Bruins’ perimeter game was not effective. 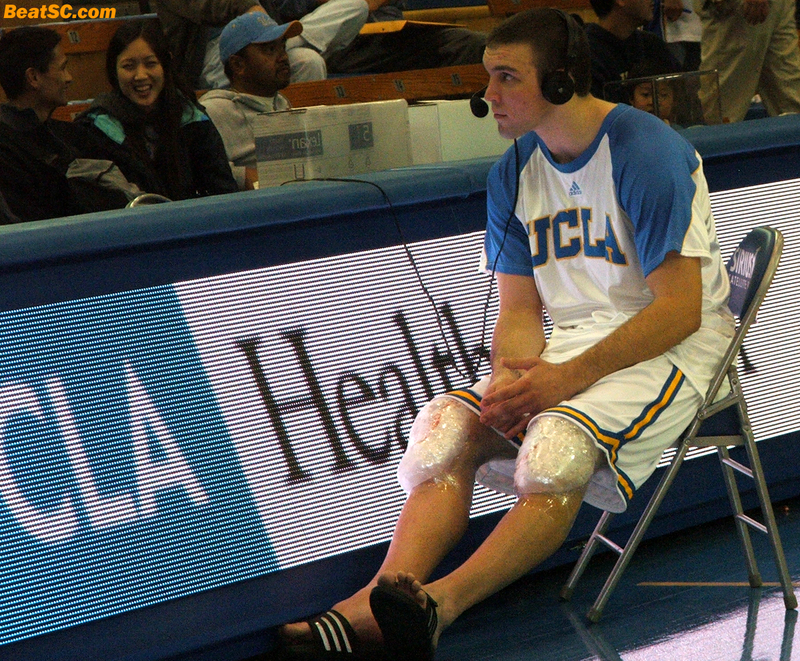 The Bruins went 3-12 from three-point land, and their best outside shooter Michael Roll went 1-7 from the field. But Nelson went 7-8 from the floor, and 7-10 from the Charity Stripe, to compensate for Roll scoring only 2, and Malcolm Lee scoring only 7. 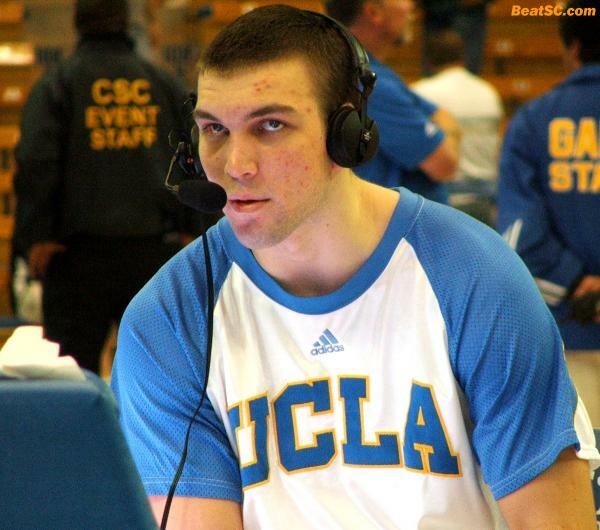 Also helping out in the scoring column were Nikola Dragovic and Freshman Tyler Honeycutt, who got 11 each, while the Bruins were led in Rebounding by… MICHAEL ROLL, with 7! Maybe he was compensating for his poor shooting by crashing the boards more. There is also the possibility of a stat-keeping error, as Ben Howland insisted after the game that the Rebounding stats were incorrect. 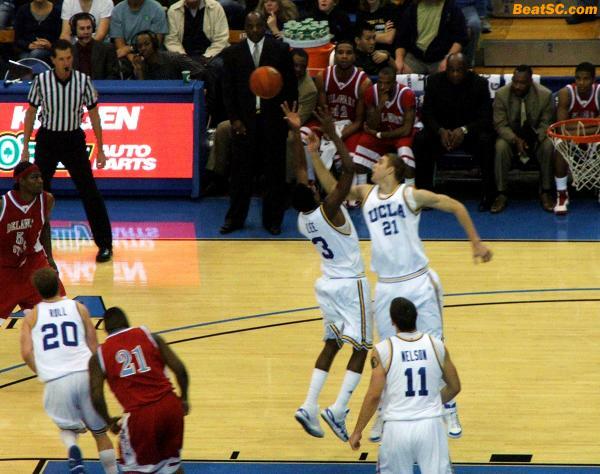 The Bruins expanded their lead to 27 in the second half, before hitting a major lull. They almost let the Hornets back into the game, as Turnovers against a full court press allowed DSU to cut the lead to 14 with about 5 minutes to play. Jerime Anderson struggled with ball security, committing SIX Turnovers. However, he “made up” for it with SIX Steals, and SIX Assists. Just call Jerime Mr. 666. And then pray. UCLA was able to control the game with their height advantage, winning the Carom battle, 35-25, and ruling the Paint in general. Even Brendan Lane found a little more success, against the smaller opponent. Bobo Morgan was active early, but not too productive in the long run, and Mike Moser came in and got very involved, only to blow two plays and sustain a temporary injury. But after seeing Lane make big strides practically overnight, there is still hope for Morgan and Moser. Just don’t hold your breath. And I’m sure you’ve already given up on Anderson. But Howland hasn’t, and probably won’t, so hopefully, the light will come on (for JA, not BH), and Anderson will start to emerge as the player Ben always knew he could be. Or not. Can Tyler run the point? The question still remains. With the Bruins up by 27 in the second half, the Bruins’ Free Throw-heckling (brain-damaged-but-super-) fan was screaming at the Hornets’ player at the line, as I suggested loudly that he relax. Soon thereafter, the Bruins were up by only 14, and struggling to regain momentum. Guess who looked brain-damaged then? 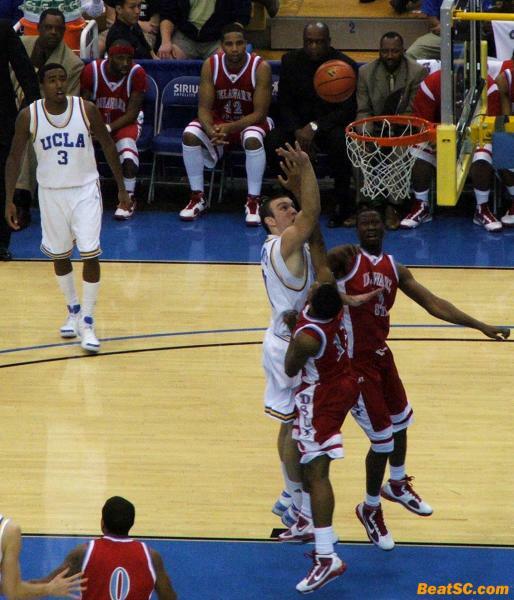 Speaking of SLOW, you shouldn’t read too much into the lack of big stats for UCLA in this game. The Hornets run a STALL Offense, taking the shot clock WAY down on almost every possession. Because they are overwhelmed in the size, speed, and talent departments, they NEED to slow down the game, and limit the amount of possessions that their opponent gets. It’s totally understandable. Boring, but understandable. The ramification is: Less shots, less Rebounds. So don’t panic that Nelson and Drago had only 3 Boards each in 28 minutes each (if you believe the stat sheet). 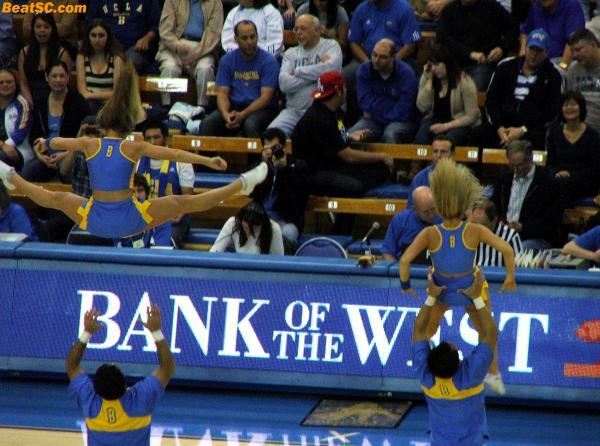 The slow pace also explains why UCLA could muster only 66 points. But what’s sad is that even when the Hornets were down 20 with time slipping away in the second half, they STILL were SO plodding and methodical that it seemed like they could never catch up. It’s like a Football team running up the middle repeatedly during a two-minute drill. 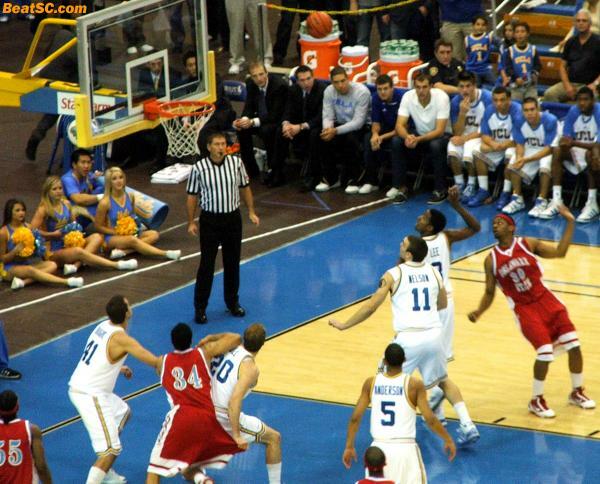 Even though they felt the urgency to implement a full court Press, they didn’t feel the need to shoot the damn ball in less than 25 seconds when they got it on Offense. One thing is for sure: Despite getting throttled for 25 minutes, Delaware State definitely did not quit. 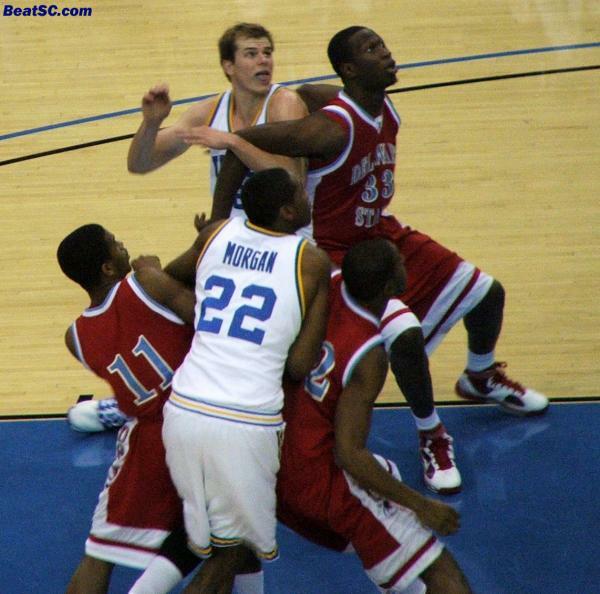 And UCLA should definitely NOT be happy about how they let this team back into the game. The third string should have gotten a lot of minutes in this final “preseason” game, but the Starters had to make sure everything was settled before exiting, and it took a lot longer than it should have. One Bruin who has EVERY right to be happy tonight is BARON DAVIS. The Clipper Point Guard hit a fallaway jumper AS TIME EXPIRED to beat the Boston Celtics at Staples on Sunday night. Baron had 24 Points and a season-high 13 Assists in a dramatic victory, where Boston had the game seemingly locked up. With the score tied, Baron fouled a driving Rajon Rondo as the clock went to zeroes. But they added 1.5 seconds back on the clock, Rondo MISSED BOTH FREE THROWS, and with 1 second left, Davis did the rest. 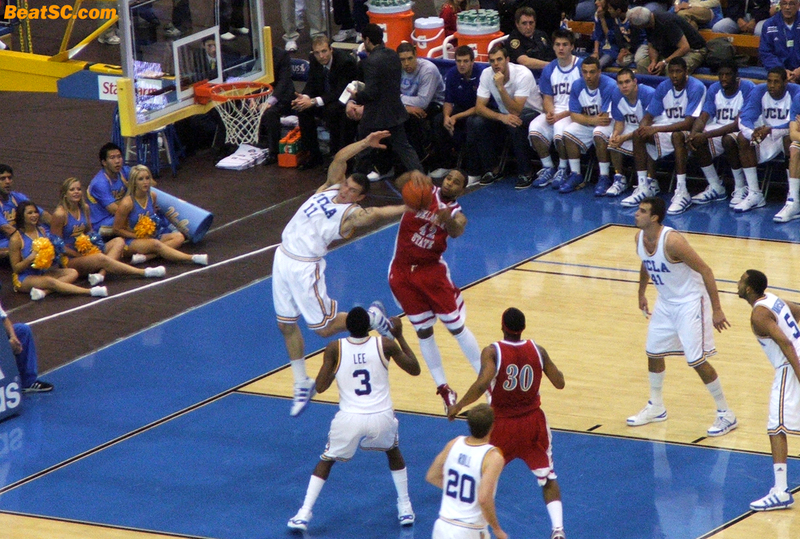 Before the final play, Davis demanded that the Coach let Davis take a fallaway jumper to win it, so Mike Dunleavy drew up a play to get Davis open off a screen. 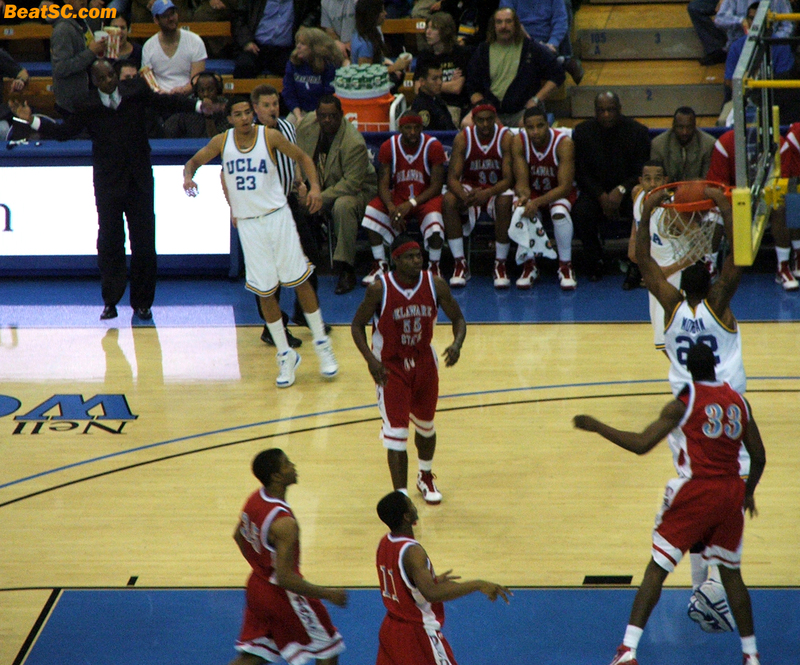 Davis got the ball, and had a hitch in his shot, but just barely beat the buzzer. The Refs had to review it, and the replay showed that he made it with no more than a tenth of a second to spare. The cool thing was that the Celtics LEFT THE FLOOR before the review was conducted — They couldn’t even FACE THE POSSIBILITY of losing to the Clippers (for the second year in a row). 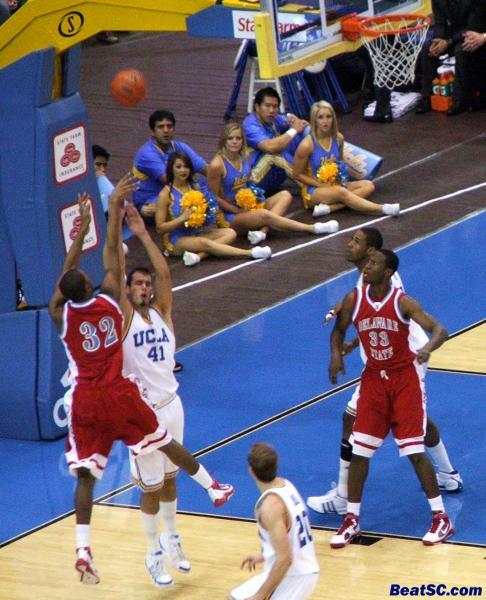 Not only did a Bruin lead the Clips to the upset of Boston, but he got an assist from a trojan. The Celtics’ Brian Scalabrine played 10 minutes for Boston, and in that 10 minutes of playing time, he scored ZERO Points, got ZERO Rebounds, and committed 2 Personal Fouls. 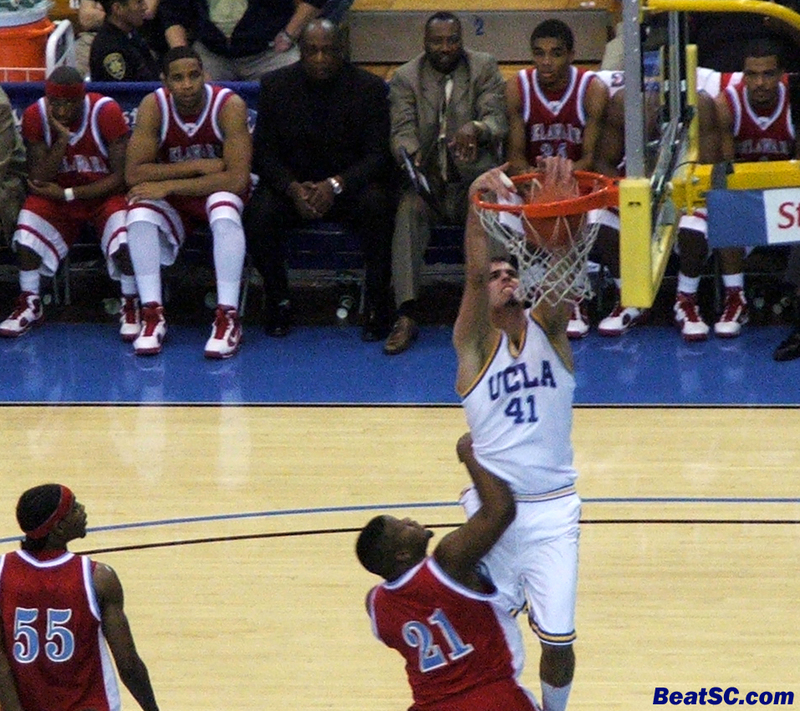 Below are 20 photos from the UCLA-Delaware State game. If you click on them, they enlarge, and if you just hover your cursor over them, a hidden caption should pop up. "DON’T FEAR THE REEVER" was published on December 28th, 2009 and is listed in Blue & Gold News, UCLA/usc/Cheerleader Photos, UCLA/usc/Sports Photos.